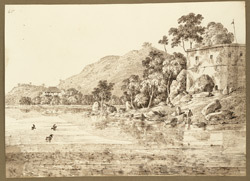 Pen and ink drawing, by Sir Charles D'Oyly, (1781-1845), of a view of the Ram Silla Hill and the bungalow belonging to George Proctor Beauchamp, Collector of the Pilgrim Tax at Gaya in Bihar, dated 25th December 1824, from an album of 80 drawings of views in Bengal and Bihar taken between January 1823 and May 1825. Gaya, near the sacred site of Bodh Gaya where Buddha achieved enlightenment, is also a very important pilgrimage site for followers of the Hindu and Muslim faiths as well as for Buddhists. This image is from a group of drawings dated between 18th December 1824 and 2nd January 1825, which were clearly made during a Christmas tour to Gaya when D'Oyly visited his friends George Proctor Beauchamp and Christopher Webb Smith. A few years later D'Oyly and Smith produced two books together: 'Oriental Ornithology' (Behar Lithographic Press, 1829) and 'The Feathered Game of Hindostan' (Calcutta, 1830), with illustrations of birds by Smith and landscapes by D'Oyly.